LHSA's rich history of psychiatry collections are understandably popular with researchers: with collections from the Royal Edinburgh Hospital, Midlothian and Peebles District Asylum, Haddington District Asylum, Bangour Village Hospital, and Roxburgh, Berwick and Selkirk District Asylum, we have built up a rich picture of Scottish psychiatric hospitals, their patients and their medical staff, particularly in the late nineteenth to early twentieth centuries. Of these collections, our material from the Royal Edinburgh Hospital is undoubtedly the most consulted. Of particular interest to many researchers are letters written by patients, which we originally found inserted into the pages of the hospital case books. These letters have been the subject of academic scholarship in recent years, and are also popular with history of psychiatry students (who persevere despite the fact that they can be notoriously difficult to decipher!). Letters were written to patients' relatives, friends, and some to the medical staff of the hospital. So why were they never sent? One possible reason for their retention by the hospital staff may have been that they did not want to distress potential recipients with some of the contents of the letters, or that doctors were worried that letters may not have painted the hospital in a very positive light. The 1866 Scottish Lunacy Act allowed physicians to suspend letters they felt to be unsuitable (excepting complaints sent to the General Board of Control, the body that policed asylums in Scotland). However, a couple of years ago, I found a reference to the confiscation of patient letters in a Royal Edinburgh Hospital annual report of 1863, in which the Physician Superintendent, David Skae, defended the practice by stating..'it has long been observed that the letters of patients in many instances betray their insanity and morbid impulses much more frequently than their conversation'. Skae went on to state that he had been given authority to confiscate letters by the hospital Board of Directors (an earlier internal regulation than the 1866 Lunacy Act), but that many letters did in fact get sent out and received by patients, and that any inspection or retention of letters was always communicated to the writer. Grace's quietness and industriousness were not to last long, however, since throughout her admissions, her illness manifested itself in 'abhorrent language' and also more physical acts: tearing her clothes, refusing to be moved, and in breaking windows. This erratic behaviour seems to have earned her a reputation with the doctors and nurses, who moved her between several galleries (wards) of the hospital (including confinement alone) during her time there. Grace seemed to have had little time for her medical attendants, who stated that 'she constantly tries to bring charges against the officers and attendants of cruelty and neglect not so much to herself as to the other patients'. Moreover, Grace is often described as 'obstinate' in her case notes, and her actions can be read as both affects of her illness, and as acts of resistance and defiance against the depersonalising regimes of the hospital (it is mentioned that 'her head was shaved', for example). Her decline is clear to trace, however, for by 1873 she is described as more and more feeble and habouring 'delusions of conspiracies against her'. She was apparently 'still very argumentative and cantankerous', though (which just makes me like her more!). The two most interesting aspects of her case, however, were the descriptions of her medical treatment and the writing that she did whilst a patient. The enquiries we tend to get about patients at the Royal Edinburgh Hospital usually cover the late nineteenth century: since Grace's case started in the second earliest volume of the case books that we have, I found a rare excuse to look at descriptions of earlier psychiatric treatment. For example, Grace was prescribed 'a Blue pill & Black draught in the morning'. All this sounded very strange to me, and I wondered whether I had misread the (quite difficult) handwriting. After some research, though, I found that there was indeed such a thing as a blue pill - coming from schools of thought that advocated purging as a remedy for illness, it was a mercury-based medicine with a laxative effect, with what would now be seen as dangerous levels of mercury. A 'black draught' was another laxative medicine, made of senna with magnesia and licquorice. Grace was also prescribed another form of purging: blood-letting. On her first 1845 admission, she was treated by 'four leeches applied to the temple.' You can read about nineteenth century purging medicines and their context (albeit through United States history) here. The other factor of interest in Grace's case is mentions of her writing. 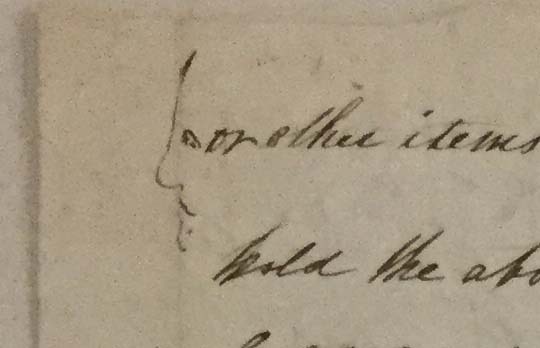 In her first admission, it is reported that she 'walks about daily and has written a note to her friend'. However, when she next appears in hospital in 1856, she has written a book, which 'was penned shortly after leaving the asylum and in it she exhibited the greatest ingratitude to parties who had treated her with the most uncalled for generosity and benevolence.' Grace Webster's writing seems to be relatively little known, and it is not easy to find out which novel this was. Grace's letter writing is often referred to in her notes, but no letters from her were inserted in the case books, which does imply that most were sent, as Dr Skae insisted that many letters were in the 1863 annual report mentioned above. Grace certainly wrote to people a lot: doctors reported that she was constantly writing to friends and medical staff saying that she wanted to leave, and this was 'almost daily'. One example of this has been retained: an 1856 'petition' she wrote 'Unto the medical gentlemen and Matrons'. Insisting that she has been 'greatly insulted and imposed upon by being brought into a place of this kind under false pretenses' (an 'airing for health' in a carriage), Grace goes on to describe the losses she believes that she has incurred as a result of her time in the asylum and its 'bad air': of health, of time and of goods. One thing that I particularly like about this document is the small doodle of a face on the last page: a practice that links people writing freehand across time (but also undermines the tone of officialdom she seemed to want to add to the petition). Sadly, Grace died soon after her 1873 discharge from the hospital, but perhaps the letters found in her chimney will inspire a new interest in a much-forgotten life. Tomorrow is Nurses' Day (also Florence Nightingale’s birthday) and an opportunity to celebrate all the amazing work nurses do around the world! A little closer to home and our blog this week throws a quick spotlight on the collections we hold that relate to nurses and nursing history, and that serve to record the valuable contributions of nurses to healthcare in the Lothians. Our source list at http://www.lhsa.lib.ed.ac.uk/source/nursing_index.htm gives lots of information about the types of nursing-related material we have, from records that show individual nurses’ experiences, to papers that describe the wider nursing training programmes and their working lives. We have some wonderful photographs of nurses too and you can see a wide selection of these online via Scran: click here to see one of my favourites! We’re also celebrating nursing as part of our current exhibition, ‘Dawn of a New Era’, to commemorate the NHS's 70th birthday. The exhibition opened in April and will run until 15 August in the Centre for Research Collections, Edinburgh University Main Library – from 22 June we’ll have an additional display case dedicated solely to nursing. You can follow all the nursing stories that will be told for Nurses Day on Twitter - look out for hashtags #ThisNurse #NursesDay and #HistNursing.